In Part 1 of this series, we examined the importance of seeking to understand the signs in the heavens, and we looked at the first Blood Moon of this unique tetrad. Let’s now turn to the second Blood Moon and see what God has written overhead. 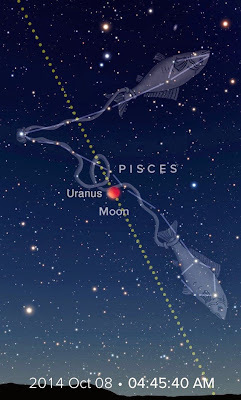 This Blood Moon appeared in the constellation Pisces, covering the planet Uranus, as you can see in the picture. The green, dotted line is the ecliptic plane. Pisces: This constellation is portrayed as two fish, connected together by a band. As you can see from the picture, one of the fish remains on the ecliptic, while the other rises up. Uranus: The is the ruling planet of the constellation Aquarius. Unlike the other planets, which are named for Roman gods, Uranus takes its name from Greek and personifies the heavens and the night sky. Uranus represents the “Father Sky” or Father of Heaven. 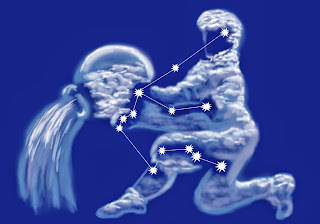 Aquarius: Traditionally displayed as a man carrying a water pot, this constellation's earliest known identification was with the Babylonian god Enki—"Lord of the Earth," the God of intelligence and creation. His symbolic number is 40. 40: Interestingly, this eclipse took place on the last day of the 40th week of 2014, which is to say, exactly 40 weeks, or 280 days (40 x 7), from the first day of 2014. The number 40 appears repeatedly in scripture, and is usually associated with purging or purification. When the Lord hung on the cross, and the sun was darkened at noon, if you had looked up in the sky to see what was overhead, you would see the sacrificial sheep in the pattern of the stars; what we call Aries today. 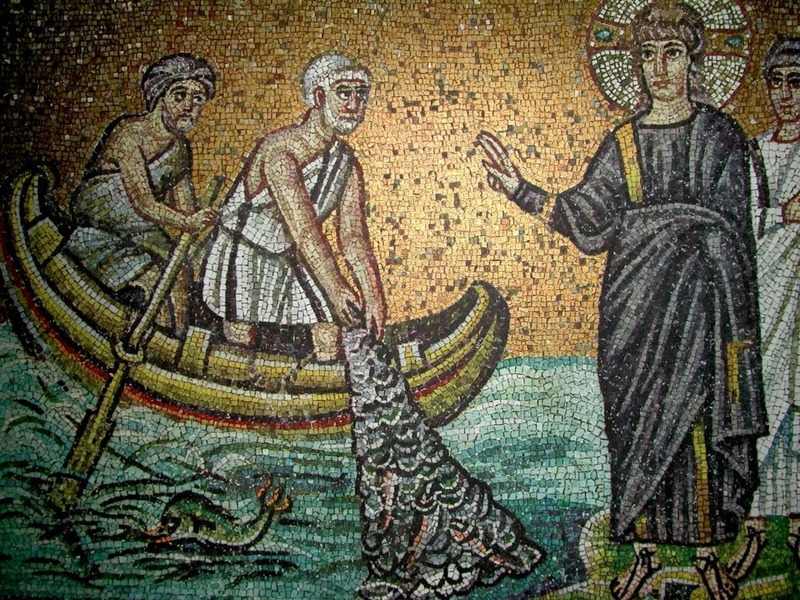 Proceeding forth from under the forefoot of Aries, we have renamed it “the bands of Pisces,” but it should be more appropriately rendered as the net of Pisces. Because from under the fore leg of the Lamb, was cast out a net. So according to Christ, at the end of the world, angels will come and sort through the catch, severing the wicked from among the just. The symbolic number 40 represents this purge, and the number 7 indicates it will be complete. 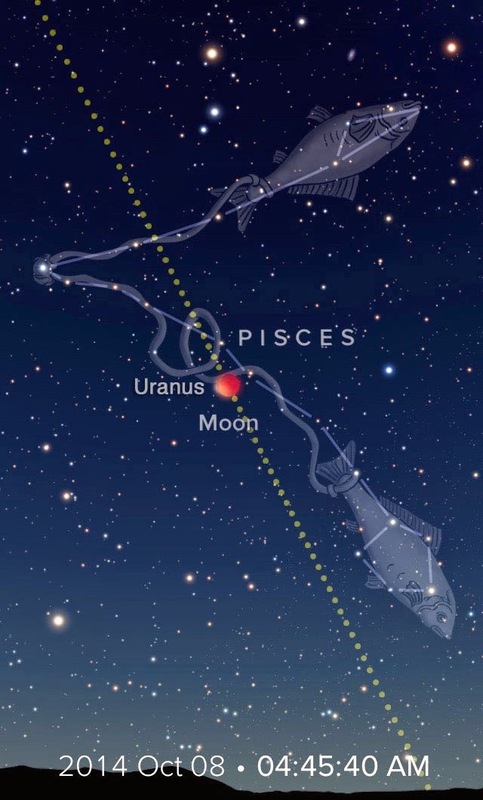 As you can see from the picture, the Moon and Uranus are severing the bands between the two fish. The upper fish is then free to rise up to where the Father is, and the lower fish remains on the ecliptic, forever circumnavigating, round after round. The bands are cut. The sorting has begun. What are we to understand by Zion loosing herself from the bands of her neck; 2d verse? I'm eternally grateful for the LDS Church. It has filled a vital and wonderful role in the Father's plan. The Church, through its missionary efforts, has cast the gospel net far and wide throughout the earth, catching many millions of people, who have learned of Christ's gospel, the Book of Mormon and Joseph Smith. This foundation has led some few hungry souls to seek for themselves greater light and knowledge than what is now offered by the church. Sadly, these are the souls most likely to be cast out of the church. The net had to capture many millions to ensure a large enough population from which the angels might pluck a few hundred or a few thousand to build Zion. I'm grateful for the opportunity I had to assist in casting that net as a missionary. 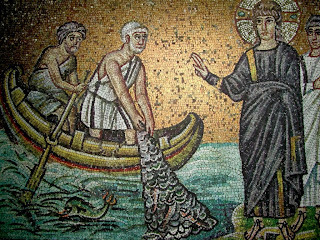 It was a privilege to serve Christ as a fisher of men. The foundation given me by the LDS Church is a priceless treasure, a pearl of great price, that has led me to seek the Lord. Words cannot express my gratitude for what I have received from the Church, and where that foundation has led me. But sadly, the LDS church is now fulfilling another part of its divinely appointed role by casting out and persecuting true followers of Christ. In so doing, they disappoint church members who expect something better from the Lord's church. The changes in the church teachings and the persecution of believers are bothering some members enough to awaken them as well. Those so awakened are loosed from their bands so they can rise up to God. Our sustaining is an oath-like indication that we recognize their calling as a prophet to be legitimate and binding upon us. Yeah, he said that. He spoke the truth, too. Make the oath to a man, and remain bound. The angels gather the good out from the net, teach, empower and prepare them, then send them forth to declare the word of Christ and bear testimony of Him, that the remnants may be gathered and the Father's covenant fulfilled. The Book of Mormon makes this abundantly clear. And now, let's recall the message of the first Blood Moon. The wheat is being gathered from among the tares. As with the fish, the separation is underway. The repetition of the message underscores it, lest there should be any doubt. More than just His spirit will be poured out. Destruction and burning await, yet the Father's work will triumph. This is happening now. The angels have already started gathering those who will come. In case it wasn't in your church bulletin, God wrote it in the sky last October. Please seek Him while there's still time. Note: For some of this content, I owe a debt of gratitude to good friends who pointed my face skyward with eyes to see. They know who they are, and are gratefully acknowledged. Thanks for the thought-provoking post, Adrian. So much information. I, on the other hand, simply "know it in the bones of my soul". Thank you, Adrian, for all the work you do! I am amazed at how well you can explain this. Just thinking about the research it took to put all of this together blows my mind. Thank you for doing it for us. It means to world to me. I felt a lot of this in my bones but this post clarifies it so well. I've had so many "ah ha" moments at the things the Lord has been teaching me lately and just now reading- the "Gospel Net" IS the LDS Church, my jaw dropped. It just helped a bunch of things come together... the Oct 8 2014 blood moon was the coinciding General Conference that I felt "cut from the net", it was prophesied, right in front of us in D&C 113 (Joseph asks about Isaiah 52 & now the answer makes sense in this context) and then, there it is "written in the stars" all this time it was in Gods mind from the beginning. Just amazing to me. As hard as it is to "awaken to", it also give me peace to know it was part of God's plan. I'm feeling the blessing and excitement of "watching" for the signs! This series is an answer to prayer. Thank you. Very informative Adrian, thank you!